No better place than Viscri for a weekend workshop on interior design inspired by Romanian tradition. Two full days of intense work, time to discover the richness of Romanian tradition, discovering the village life, and visiting the fortified church which is part of the UNESCO heritage. When you arrive in the center of Viscri, turn to the right and you will discover a bit further on the left Viscri 125. A wonderful place to relax and forget the stress of hectic life as soon as you pass the gate of one of the typical houses from Transylvania. We all arrived on Thursday evening, got to know each other over a nice dinner. After a refreshing sleep we were ready to discover the Romanian folklore, Romanian wooden houses and their interiors. Romanian tradition is still very strong thanks to the rural life in the village. It takes 7km off road to arrive in Viscri. No paved roads. The barn is the center of the guesthouse: the place to relax, to eat, to discuss with friends late in the evening or to get inspired during a workshop. 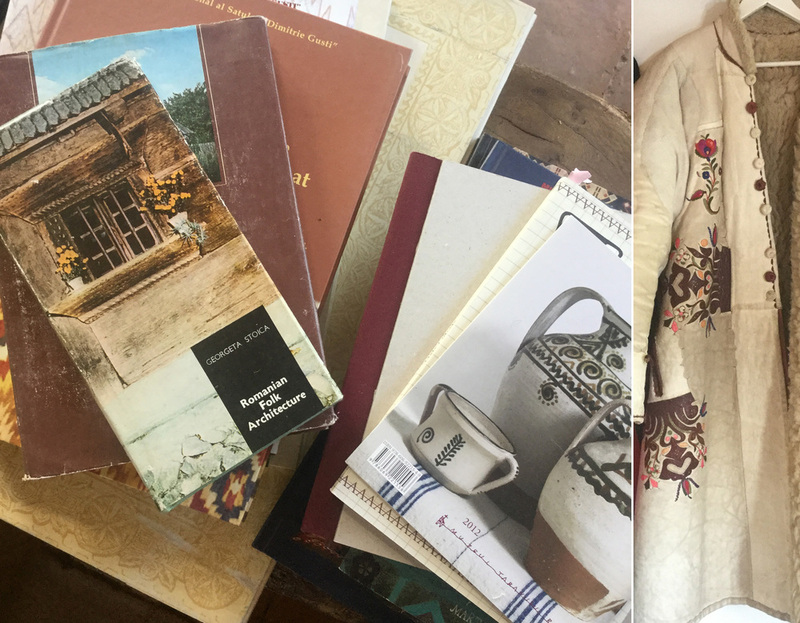 When I started to study the Romanian traditions I soon realised I started probably a life time research, Romania has so much to offer and there is little written about. So I have to discover more about the Romania's Secret Language. I could find some books in antiques shops, and the Peasant Museum in Bucharest is publishing some small books on different topics. 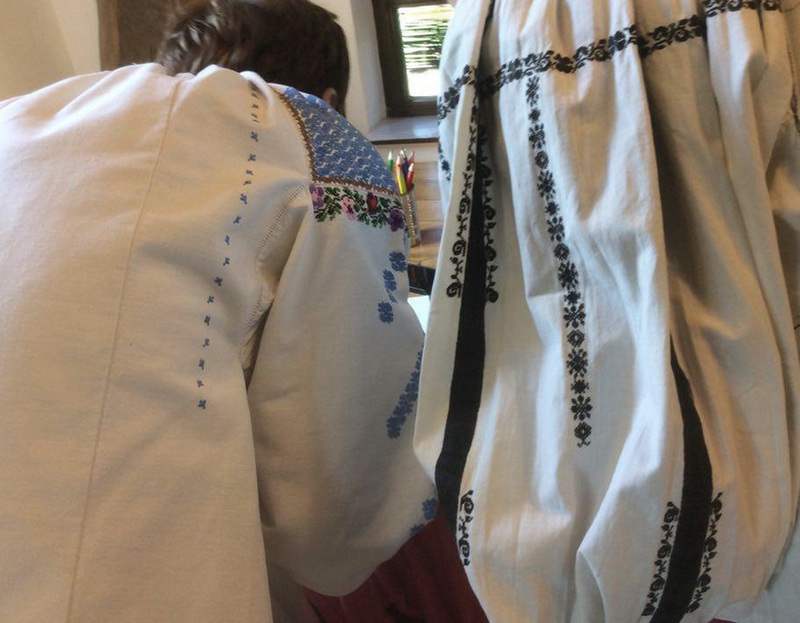 Some of us brought our Romanian blouse, some treasures we found in different parts of Romania. Black and white from Sibiu, more colourful ones from the north of the country: Bucovina and Moldova. No better way to understand the spirit of Romania and to translate it in an interior. Time to start: discovering what the motifs, we see all around on the houses garments, were telling us. To understand that the use of colour was influenced by foreign people occupying certain areas of the country. Or just by people getting married to some one of another village. The decorated facades, we mostly see in the north of the country, are not just randomly painted. The eye symbol is to protect the house or the people living there, grapevine for eternal life, rooster to chase the night spirits away. What do you want to tell by decorating the facade of your house? After a day of working concentrated on decorating our country side house there was time to discover the life in the village. One morning I woke up by the noise of the cows and goats leaving to the meadow, they would cross our way again around 19.30 when they would return home. It is amazing to see that they knew exactly in which gate they should enter. The local people are producing socks and slippers from the wool form their sheep. A colourful collection will decorate their home, waiting for tourist to pass by and get seduced by the beauty of those hand made pieces. I would say: go and get some before the tradition will die. The traditional houses in Romania are often not bigger than 2 rooms: one room is the center of life as it serves as kitchen, living area. Often there is a small corner where the man can take a rest after working hard on the field all day. The other room is the bedroom for the whole family. In case the house has more rooms than there will be a room for the visitors, exposing all the beautiful rugs, embroidered linen, often made by the people living in the house or in the village. The best way to understand the size of the room is to start making a floor plan. 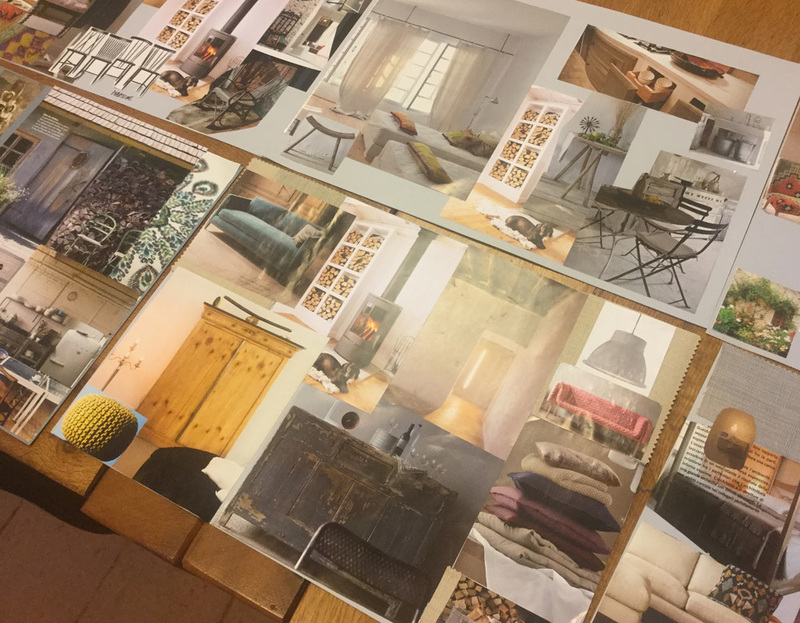 It gives you the idea of what you can do in the room, before starting to dream of putting in to much furniture. A typical Romanian house can be the starting point for decorating your country side house. By using the colourful rugs, the carved wooden furniture, a painted chest of drawers. Having a rustic wooden floor, a fireplace with ceramic tiles, Using a colour palet taken from nature. Or why not adding some Romanian furniture to your modern home in the city, the mix will give it a precious character. We explored both ways: working in a more rustic way and adding some modern touches or searching a way to integrate the Romanian tradition in a modern way. 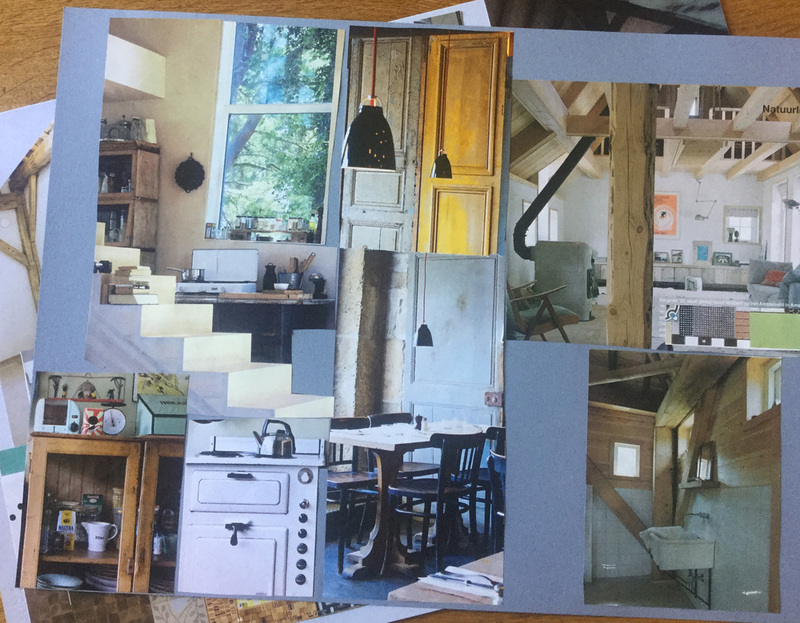 The days were to short, to many things to discover so some started to work again after dinner and finishing their mood board after midnight, showing me proudly the result in the morning. The weekend was to short, we could all have stayed another 2 days, to wander around, meet the locals, enjoying more home made elderflower limonade. Viscri 125 has the perfect mix of traditional furniture, and the modern touch. The rooms are not overloaded with rugs, ceramics and wood carving, but well chosen pieces of painted furniture. Around 19.00 they would come and put wood in the fire place to heat the room. A nice welcome home when we would come back in from a walk outside. The village is also a great way for kids to learn about traditional village life. What can be more inspiring for them than to be surrounded by nature. Not only us humans are living in houses, we make houses for birds, children will give them colour and imagine their interior. and created a wonderful small village, a world filled with colour. Nice memories of a wonderful weekend on the country side. You would like to come and enjoy a workshop on interior design? The next one will be organised after summer: weekend of 10 and 11 September.